The judge leading an investigation into the culture, practices and ethics of the press has warned editors not to target witnesses who speak out against the media with negative coverage. Lord Justice Leveson opened the public inquiry, launched in the wake of the phone-hacking scandal, in central London. He said his team would monitor media coverage to ensure those who give evidence are not given an unnecessarily tough time. "Concern has specifically been expressed that those who speak out might be targeted adversely by the press as a result," he said. "I have absolutely no wish to stifle freedom of speech and expression, but I anticipate that monitoring will take place of press coverage over the months to come. "And if it appears that those concerns are made out, without objective justification, it might be appropriate to draw the conclusion that these vital rights are being abused, which itself would provide evidence of culture, practice and ethics which could be relevant to my ultimate recommendations." The Leveson Inquiry, which sits in court 73 of the Royal Courts of Justice, was set up by David Cameron after a summer of scandal, including revelations that the phone of murder victim Milly Dowler had been hacked and the closure of the News Of The World newspaper. Lord Justice Leveson, an experienced High Court judge, will sit over the hearings, supported by a panel of experts from the fields of media, law, politics and the police. In his introductory remarks,he thanked all those who had come forward to give evidence, particularly victims of hacking. He said he had worked to combat his "perceived short-comings" in terms of how much he knows about the workings of the press. The senior judge also said there was a "great deal to applaud" in the British media and said he was not just interested in the industry's failures. The first part of the public inquiry will focus on relationships between the press and the public, as well as links between newspapers, police and MPs. It will also review how the press is regulated and where it may have failed in the past. With criminal investigations still ongoing, theMetropolitan Police and Crown Prosecution Service have urged caution. In written submissions, they said: "It is inevitable that this inquiry will touch on areas which may have a close connection with the criminal investigation. "We are understandably anxious that nothing should be said or done which might jeopardise either the investigation or trial." The specific issue of phone hacking, and whether illegal practices spread to other papers, will be looked at during later hearings. At their annual conference in Surrey, the president of the Society of Editors Robin Esser insisted self regulation is still the way forward for the press. Mr Esser, the executive managing editor for the Daily Mail, said: "The Leveson inquiry is very useful - more useful I think for the politicians and the chattering classes than the media. "But now it's here, we have to embrace it and make sure they come to the right conclusions." Robert Jay QC, counsel for the inquiry, made the first statements with remarks from barristers representing the newspapers due to take up the rest of the week. Victims of alleged phone hacking are expected to give evidence from November 21. The first phase of the inquiry is likely to run until the end of February. "The Leveson inquiry is very useful - more useful I think for the politicians and the chattering classes than the media. Quite. No doubt Guardianistas will lap up every tedious detail, though. A committee of MPs investigating hacking at the News Of The World will discuss on Tuesday allegations its members were put under surveillance in 2009, Sky sources have said. It follows claims made by former Daily Mirror editor and Media Guardian columnist Roy Greenslade during an interview with an online US radio station on Friday. He said members of the Culture Media and Sport (DCMS) select committee were followed by private investigators or News International journalists in 2009, before the current inquiry into alleged phone hacking. Speaking to Sky News he said: "In 2009 the staff were scrambled...in order to follow every single member of the DCMS select committee." Mr Greenslade said there was a dispute over how long they were under surveillance for but it was thought to be "between three and 10 days". He added that there was then a "complete change of heart at the top level" and "everyone was told to stop doing it, not to talk about and give up on the whole enterprise". He did not tell Sky News who ordered the surveillance but said it was a "senior executive". Committee member Louise Mensch MP told Sky News: "If, and it's a big if, these allegations are true, then it is unbelievably serious." She went on: "If it is true we will want to know who authorised it and why." Mrs Mensch added that if the claims do prove to be true "it is chilling, it is terrifying, it sort of says 'don't mess with us or we will come to get you." Sky's deputy political editor Joey Jones said the select committee already knew that Tom Watson had been under surveillance at at least one point previously. "One of the things they (the committee) were saying at the hearing with James Murdoch last week was, look, if there is information out there suggesting that people had their phones hacked or suggesting that people were followed or whatever else, you need to be actually getting this out in the open and getting it to us before it's leaked elsewhere. "It might be that this turns out to be another example of that not really happening, of the company not being on top of what was going on within its own newspaper." Meanwhile, culture select committee member Adrian Sanders said he is "passed being surprised by anything". The Liberal Democrat MP added that while it is a serious issue to intimidate members of parliament he does not believe they would have found anything interesting. Another member of the committee, Damian Collins MP, told Sky News: "I have no evidence that I was followed and I certainly didn't feel personally intimidated in any way." Mr Collins said it is unclear whether the allegations apply to current committee members or those sitting on the panel before the general election. But he said it would be a serious matter if it was attempt to gain information about a parliamentary inquiry. "This is something I'm sure the company could clear up for us pretty quickly," he added. No, it doesn't 'sort of' say anything of the kind, you silly, hysterical woman. It says, If you have been fiddling your expenses to pay for your rentboy/toyboy, don't be surprised if you end up on the front page of the NOTW. The likes of her must have been delighted when NOTW went; life became safer for them. And it also is giving the Government an excuse to try to regulate the press. Quick summary of day One. Leveson said his "Hellos" to everybody. He said Inquiry was about hacking and more generally about press behaviour. No desire to stifle freedom of speech in long term or short but he said that witnesses to his Inquiry must not be intimidated by press. Jay, lawyer for the Inquiry said the Inquiry was important. The hacking was bigger than most realised. From 2001 to 2009 over 2,200 actions by Mulcaire who was working effectively full time on this. 90%+ for NOTW actioned by 28 journalists there but two other actions at least may refer to journalists at Sun and Mirror. Over 5000 potential hacking victims. 11,000 pages of Mulcaire notebooks have been read by Police who are now tackling 300 million emails recently handed over by NI. Inquiry wider than just hacking. All kinds of underhand techniques of newspaper reporting will be examined together with relationship of press and public. All actions of news media will be examined and there will be no kowtowing to powerful interests. For example need to look at whether there is any trust in PCC any more among public though Leveson stated he backs self regulation of press. Neil Garnham, Met Police & CPS Lawyer said ciminal investigation will be long, At least a year. This Inquiry will report before then. He admitted Police/Press relations have not always been perfect and some things have been wrong in past (eg people in future wont be able to move from Press job to Police and vice versa so easily) but said a healthy relationship is beneficial. After initial investigation into hacking by Met Police there will be further work on any unlawful conduct of Police or journalists and an inquiry into the initial Met Police handling of the case. Oh, in between Jay and Garnham, David Sherborne a victims lawyer intervened to say his court room computer had been affected by a trojan. Call me cynical, but I get worried when governments start making noises about regulating the press. Its just not fair. Scotland Yard wont take him seriously. And now the McCanns may be able to participate in a high level enquiry.... And get their expenses paid. Clamping down on freedom of speech and freedm to criticise, on the internet and elsewhere? Kate and Gerry McCann want to highlight their experiences at the hands of the British press during the judicial investigation into the phone-hacking scandal. The couple, whose daughter, Madeleine went missing in May 2007, were among those named yesterday as potential witnesses in an investigation provoked by anger at journalists' illegal interception of phone messages. But the couple's spokesman, Clarence Mitchell, said there was no evidence their phones had been hacked. He said the couple, who live in Rothley, hope to be granted "core participant status" in the inquiry, expected to deliver its report in a year. This would give them the right to be represented by a legal team, who could cross-examine witnesses and make opening and closing statements. Mr Mitchell said the remit of the inquiry was far wider than phone hacking. "It is going to be looking at press ethics and media activity in general and they are deemed to be relevant witnesses on that basis," he said. "Assuming they get that status, the plan will be that they will give evidence about their treatment at the hands of the press more generally." Inquiry officials appearing at the High Court, in London, yesterday published a list of names and organisations who will appear as witnesses. They included former News International chief executive Rebekah Brooks, former senior Metropolitan Police officer John Yates, News International, the Guardian newspaper, Express Newspapers and the Metropolitan Police. The McCanns have spoken and written about press intrusion and misrepresentation of their campaign to find Madeleine, who disappeared from her family's holiday flat in the Portuguese resort of Praia da Luz, in the Algarve, on May 3, 2007, as her parents dined out nearby with friends. In March 2008, they accepted a payment and front page apologies from Express Newspapers. It related to what they said were 100 "grotesque and grossly defamatory allegations" in the Daily Express, Daily Star, Sunday Express and the Daily Star Sunday. Mr Mitchell has previously told the Leicester Mercury it is possible he was a victim of illegal attempts to access his mobile phone messages at the height of the case. He said, in July this year: "We were not naive. "At that time, we knew it was a possibility that this was going on so we were always careful about what we said in messages." Other people whose names were put forward for core participant status yesterday were former Formula 1 boss Max Mosley and Chris Jefferies, the former landlord of alleged murder victim Jo Yeates. Barrister David Sherborne said he also represented another group of more than 100 "victims'' whose voicemail had allegedly been intercepted. He said many of those had already launched legal action against News of the World publisher News Group Newspapers, which is part of News International. Who watches the watchmen? That’s what the Leveson inquiry into press ethics, which began on Monday morning, hopes to determine. Prompted by the revelations that reporters had used private investigators to illegally hack into the voicemails of celebrities, politicians, and the families of victims of crimes, Lord Justice Leveson is conducting the hearings to examine the “culture, practice and ethics of the media”; witnesses will include alleged victims of phone hacking, such as the families of Madeleine McCann and Milly Dowler. Leveson opened the inquiry Monday monring by stating that his aim is to establish “who guards the guardians”: “I fully consider freedom of expression and freedom of the press to be fundamental to democracy, fundamental to our way of life. But that right must be expressed with the rights of others in mind,” he said. There’s also concern that the hearings won’t be robust enough and that its outcome will simply be a curtailment of press freedom. But has the UK press spun out of control? 1. Leveson is deeply tainted by his close relationships with the elite, the government, the Murdoch Press and the Met Police etc. 4. PREDICTION: Leveson and the government will use public sympathy for the parents of Milly Dowler and Madeleine McCann to place new restrictions on press, media and internet freedoms.. If they are going to be able to cross-examine witnesses, does it also mean that they are open to being cross-examined themselves? If so, a competent barrister could make the same observation as quoted above, and tear them to shreds. No, sorry, it does not work that way. Read up on public enquiries. What really is so awful isn't only the ignorance they show of specifics like the details of the McCann case but their obvious ignorance of common facts about important things that are happening all around them in society. Every single thing that is happening, no matter where, is viewed by them through the McCanns, greenink. They must be the most powerful people on earth. 2.33pm: Gerry and Kate McCann, the parents of missing Madeleine McCann will also give evidence to the hearing. They will tell of the "blatant intrusion" into their private lives by journalists desperate to "bring home exclusives" to commercially motivated bosses. They "begged for restraint" but little was shown, says Sherborne. The pitchforkers are not going to like that very much, are they? They base their entire hate campaign on discredited press reports. This looks interesting - the context is clearing up which police force had Kate McCann's diary in its possession. So, how did it get from the Portuguese police to the NOTW, then? The private diary of Kate McCann - mother of missing girl Madeleine - was published by the NoW when her husband had not even seen it. The treatment of the McCanns was a "national scandal"
I repeat, how did it get from the PJ to the NOTW? Did money change hands? 3.50pm: Leveson may ask individual journalists who covered the Madeleine McCann and Christopher Jefferies case to respond to criticism made by David Sherborne, QC, before the break. WHO, IN THE PJ, PASSED KATE MCCANN'S PERSONAL DIARY ON TO THE NEWS OF THE WORLD? So that was the route; someone in the PJ passed/sold the diary to CdM, and it was sold to NOTW by a Portuguese reporter. Time the truth about this abuse of police power and corruption was made public. How would the NOTW get their hands on Kate McCann's private diary? I don't understand this. Are we supposed to believe that the NOTW stole her diary, then printed its contents in the newspaper? Look, it's simple, really, do try to keep up. 1. The PJ had been entrusted to keep hold of Kate's diary. 3. Some Portuguese journo then passed it to NOTW, who printed it in good faith. 4. NOTW then found out what had happened, withdrew as much as they could, from the online edition, apologised to the McCanns, and made a donation to the fund to find Madeleine. Big question is - Who is the rat in the the PJ? Former PJ coordinator Gonçalo Amaral retired at midnight on 30 June 2008, to "savour freedom of expression"
I am sure it is all just an unfortunate co-incidence. 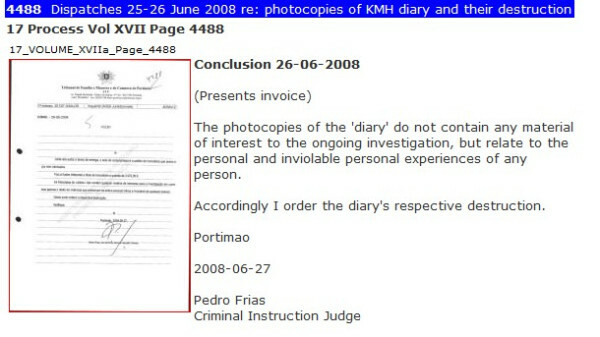 Didn't a Portuguese Judge refuse Amaral the right to use the diary as evidence? Bonny - is this the PJ who threatened Kate with prosecution for commenting on the Bible? The very same who are held in such high regard by members of certain forums? That's the very one, sans. I am still diary-hunting; it is well-nigh impossible to find anything sensible on MCF now, as it is cluttered up with all those ancient newspaper reports JCL insists on posting. Which is why there are Lord knows how many references to diaries, but not the one I actually want. I will keep looking - unless someone has a proper link? So, the order to destroy the copies is given on June 27th, 2008. Gonc leaves the PJ on July 1, 2008. Extracts appeared in CdM July 26th 2008. What a happy coincidence - material that should have been destroyed not only being leaked but proving Gonc right! Who'd have seen that coming? And I suspect that, when it appearing in the Portuguese press illegally didn't cause enough of a row, someone got in touch with NOTW and spun a yarn. It is entirely possible that NOTW was unaware at that time that the material in the possession of the PJ should have been destroyed. Not passed by someone *cough* to Portuguese tabloids. Didn't Amoral write sometimes for CdM? I wonder if Levy might have been involved as a 'go between', or something? The PJ already considered Kate's notes to be important for the investigation in its interim report and Prosecutor's Office filed a request that the diary be added to the case evidence. But the criminal instruction judge presiding over the investigation in Portimão rejected the request, as did the Évora Court of Appeal. Nice one, Tony. I see they managed to wheel on the predictable talking head to pronounce on guilt by pen-color. It doesn't seem to have occurred to any of them that that material was simply not supposed to be in the public domain to begin with, or that a judge ordered it destroyed. I personally would not be surprised if it hadn't been altered from the originals, anyway - Team Gonc seem to be a dab hand at that. Seriously, what contempt for the law, and normal police practise, Team Gonc show. There's the diaries, and there is also all those statements given to the UK police in UK police stations that have ended up plastered all over the internet. It isn't just the 'Gaspar statements' that were leaked - all the rogatory statements were, too. By none other than Levy. Is there anyone naive enough to think that Levy won't have 'corrected' them? What a shower of twisters Team Gonc are. Amaral, needs questioning as to how the diary finished up in the hands of a newspaer after two courts had ruled they be destroyed. Isn't that termed as contempt of court? lily wrote: Didn't Amoral write sometimes for CdM? Oh, so he did, Lily! Just another happy coincidence, no doubt. Amaral, needs questioning as to how the diary finished up in the hands of a newspaer after two courts had ruled they be destroyed. Doesn't he just, Tony? Hopefully, as the NOTW no longer exists, they will now feel free to tell the inquiry exactly how they came to have it, and whose hands it passed through.